Got a fussy eater in the house? This book is for you! Join Trevor as he tries to convince his fellow piranhas that vegetables and fruit are as good as meat. Piranhas Don't Eat Bananas by Aaron Blabey is shortlisted by CBCA Book Week 2016 for the Picture Book of the Year. This is the story about Brian who is a vegetarian piranha and wants all his mates to give fruit and vegetables a go. Now onto some ideas for locating teaching notes, resources and lesson ideas! 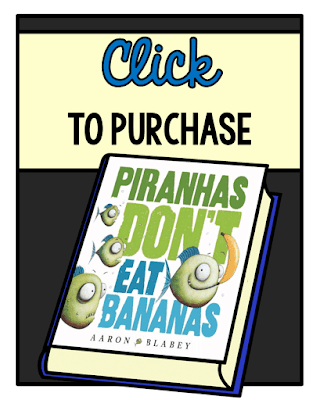 Sydney Morning Herald has a video of Aaron Blabey reading Piranhas Don't Eat Bananas. Be warned though it does like to play an advert first. I like this idea as a starting point for the book to have kids visually state what they think is better meat or fruit and veg. Could be then used after the book as well to discuss Brian vs other piranhas. 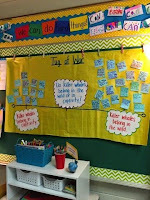 Yellow Bean has a simple 5 step lesson and activity sequence available on their website for free. Enchanted Learning have a free anatomy page as well as some basic general information about piranhas. Relief Teaching Ideas has step-by-step instructions (with photos) of how to draw this little art piece. I thought it would work well if you added a body part or fruit to show what they were eating! 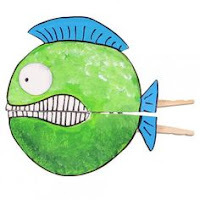 Clever Patch has this cute little piranha template available for free on their website. Use as a craft/art activity or use to tell the story (you could also get students to place rhyming words inside the mouth!). Kinder By Kim has this idea of a piranha template that you open up with cloze type sentences inside. Good idea for younger students - perhaps have them write two rhyming words from the book instead - older students could write their own two line rhyme in Blabey's style. Twinkl has a set of free words on piranhas. Note that you need an account to download. SparkleBox has a range of free printables (including posters and word wall cards) of fruit and vegetables. Use as part of a health or garden lesson to tie in with the book. Click on the board cover above andfollow my Pinterest board for links, ideas and more for Book Week 2016.